What do you need to do before building a runoff harvesting system? If you are building on communal lands, the community must get together and agree on ownership, operation and maintenance of the system. You need to assess whether the system will cause any problems for people in the area. Are there buildings, roads or paths nearby? You will need human labor, drought animals or earth moving machinery depending on the size of reservoir or tank you plan to build. Where can you collect runoff water from? Rain that falls on roads, fields and bush can be collected. If there is any possibility of contamination of the water by human or animal waste, it is vital to treat the water before use if it is to be. Risk of contamination with industrial or agricultural chemicals should also be assessed. What is a water pan? It is a hole or pond dug in the ground, used to collect and store surface runoff from uncultivated grounds, roads or laggas. It can be square, rectangular or round. How much water can a water pan hold? The capacity is variable and depends on site conditions and how much one wants to invest. Common ones are 400 to 1,000 meters cubed. By altering the shape of the pan, a water pan capacity can be increased with time to hold more water. Why build a water pan? How to choose where to make a water pan? How do you build a water pan? Excavate the reservoir section and use the soil to build the embankment wall, with side slopes of 1:2.5 for shallow pans to 1:3 for deep pans. To minimize water losses, compact the embankment wall by rolling with drums filled with water or with roller machinery. Line the beds and walls of the water pan with clay soil. On soils that are not water-tight, line the pan with a polythene sheet. Provide livestock watering trough outside the fenced area. How else can you minimize water losses in a water pan? How do you stabilize the walls of a water pan? How do you maintain a water pan? How do you get water from the pan to give to livestock? You can also direct runoff water into an underground tank dug into the ground. The advantage of a tank is that it is covered. This stops water from being lost into the air by evaporation. As long as the manhole entrance into the tank is well secured, it is also safer for children. Tanks, ponds, dams and reservoirs all need to be lined to stop water from seeping out. If the water stored does not leak away, there will be more available for use in the home and on the farm. Materials used for lining include clay, rubber, plastic, bricks, stones, concrete etc. Where clay is available locally, it is often the cheapest option. However, in areas without clay, plastic lining has proved to be appropriate mainly because of low cost and reliability of the material. How do you avoid silt getting into the tank? The inlet channel should include a silt trap, and could also be lined with grass or stones. How do you get water out of the tank? Water is either pumped out of the tank, or collected with a bucket. If the tank is above the water collection point, gravity will allow you to collect water from an outlet pipe with a tap. How big should an underground water tank be? This depends on how much water you want to collect, how much rain falls in the area in the rainy season, and how much money you want to spend. What shape should the tank be? Design of the tank shape depends on the soil type, which dictates the maximum possible slope that will stay in place without falling in. For stable soils the side slope ratio can be 1:1. For unstable soils, the side slopes should have a ratio of 1:2. For easy roofing, the tank should be rectangular, long and narrow. Where should the tank be built? 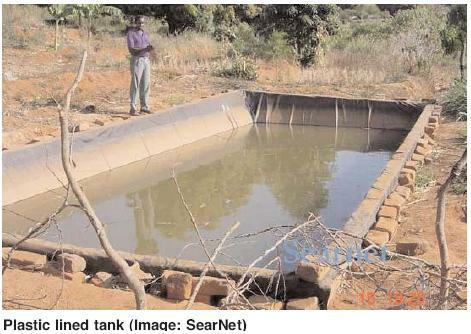 The tank should be built beneath the catchment (road, open field or roof). Mark the layout on the ground at the chosen site of the tank. What kind of plastic lining should be used? Available gauge sizes of plastic lining range from 0.4mm to 1.2mm. Thicker gauge will last longer but may be more expensive. How do you build it? How do you maintain a plastic-lined underground tank? Regularly inspect inlets, channel and collecting area. 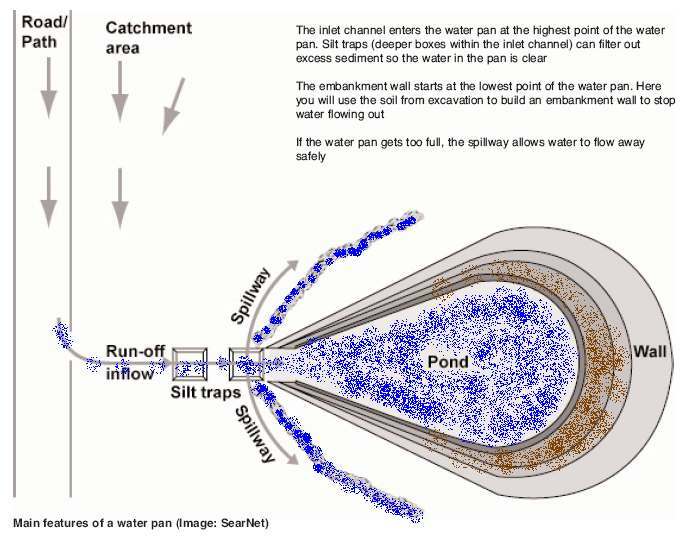 Clean the silt traps and sieve. Periodically clean tank and remove any accumulated silt. Clean with great care to make sure that the plastic is not cut/pricked. Don’t use rough tools or equipment to clean. After cleaning, check the pond for perforations and have them repaired. Supplies extra irrigation water, water for livestock or for some domestic use.